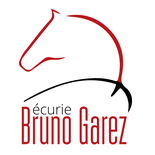 TRAINING LIVERY - Site de ecuriebrunogarez ! We take horses in for training at our stables. They can benefit from Bruno's lifelong experience in show jumping and competition at a high level. All horses take daily exercise on the horse walker, before Bruno works with them, to ensure they are in best condition. Apart from the ridden work, lungeing and jumping in liberty is also a great part of the training, teaching the horse how to take confidence with the obstacles. Bruno is renowned for his gentleness and tact with horses. Contact us so we can discuss about your project.